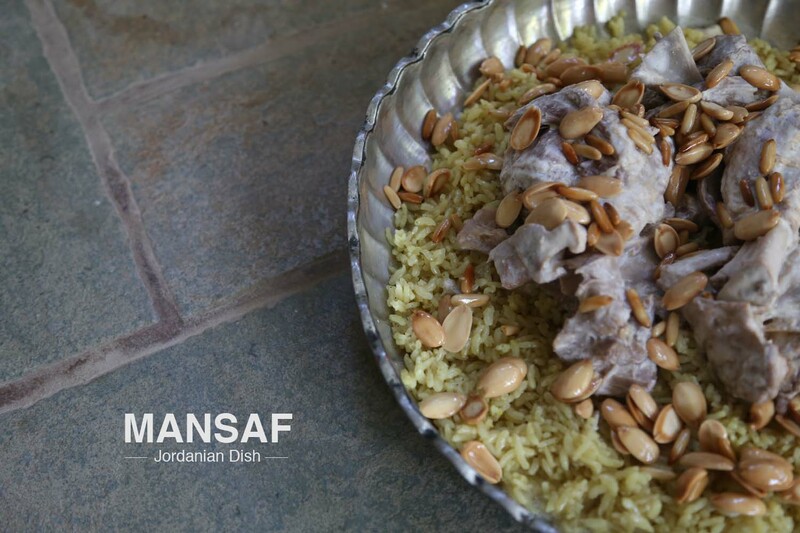 This is not it, Mansaf is a long story of meanings, findings, bindings, and a Bedouin tradition. 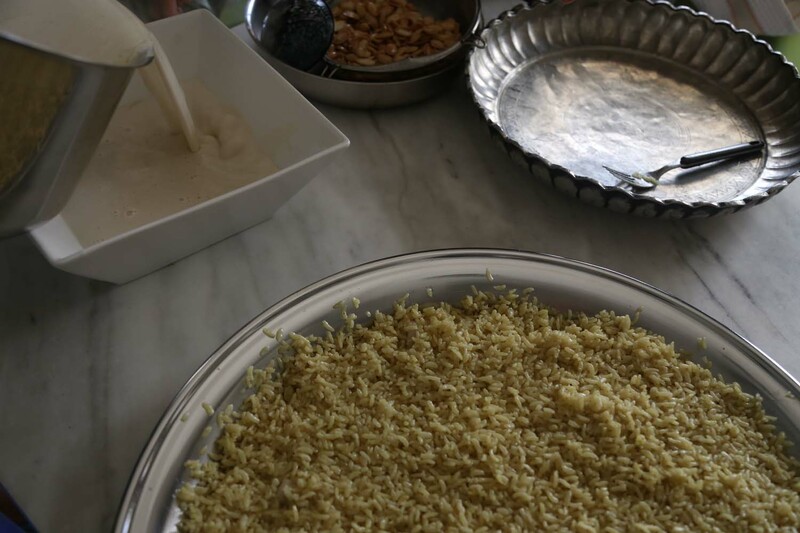 Mansaf in Arabic also means “Large tray/dish” which it truly is; Mansaf comes in a very big round tray/dish and is placed in the center of a big round table with everyone standing around the table with their left hand behind their back, and using their right hand to eat Mansaf. 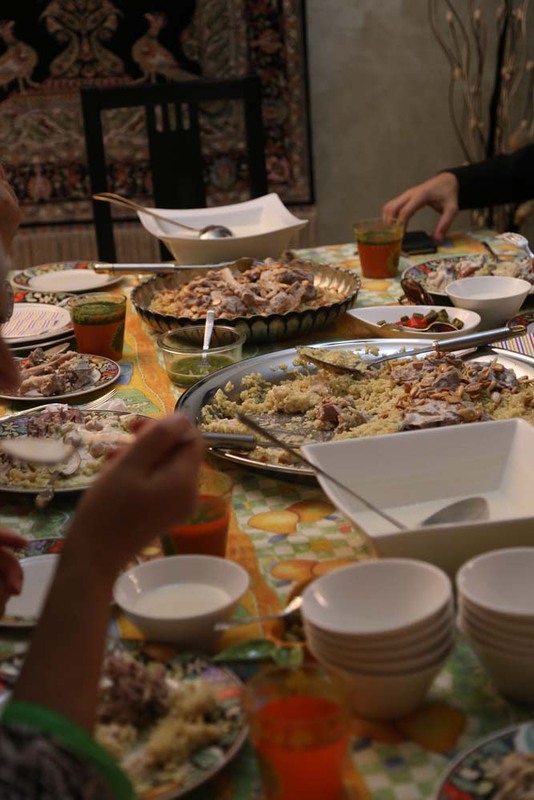 So, yes, Mansaf is traditionally eaten with your hand “although and frankly, I still haven’t tried this experience myself, but as a Jordanian, I am disqualified for this piece of information.” Therefore you can still use your fork and spoon like myself, but if you wish to try the real deal experience, then bedouin style it is. Prepare the Jameed (Yogurt) the night before. Use Pressure cooking pan for the Lamb. Wash and prepare rice ahead of time. Use a fork to test the rice once it is ready. You should feel the rice dry and not moist. Make sure the Jameed sauce is not thick before using, if it did get thick add some lamb broth. Make sure your ingredients are hot before serving. 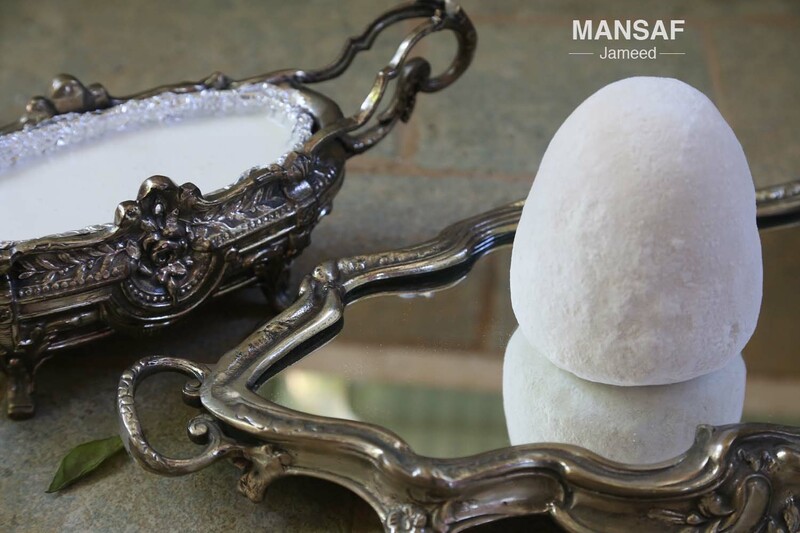 Place the Rock of Jameed in a Bowl and cover it with filtered water (If 2 cups are not enough, add more water) Leave it over night. 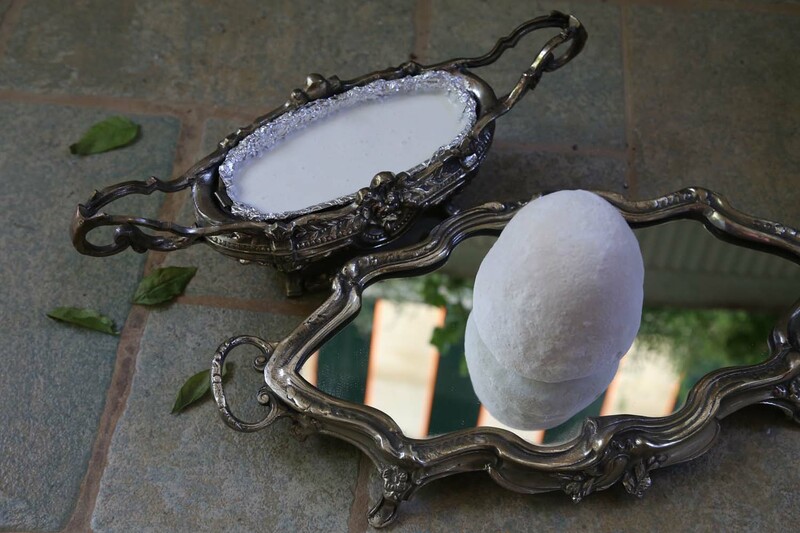 The next morning, break the Jameed into pieces while it is still in the bowl of water. Keep breaking until Jameed melts. 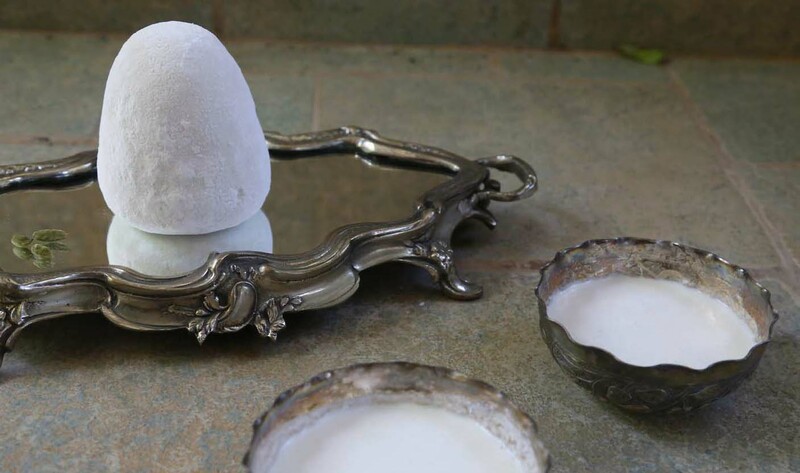 Once melted, add the Jameed plus water into a blender and mix until liquid. Add the liquid to a pot and bring to boil over high heat. Add the bucket of yogurt immediately to the melted Jameed and stir constantly to avoid breakage. Keep stirring the yogurt while you start with the lamb as described below. Once the yogurt is boiling, turn the heat off. Slightly start frying the Lamb by flipping the pieces within seconds just to give the meat some BBQ effect. Add boiled water until the meat is fully covered and leave to boil. Once you see a surface over the water and lamb (particles that look brownish/yellow) remove the pot and throw the water away over a strainer. Wash the meat again and the pot you are using, to clean it well from the particle surface produced from the lamb over first boil. Add the meat to the clean pot once again and add boiled water until it covers the lamb. Add few laurel leaves, rosemary and crushed hale. Remove Onion skin and add the round onion as is to the pot. Wait till it boils, then taste to see if salt needs to be added. Once taste is as desired, close the pressure cooking pot until you hear the whistle, add the whistling cap and leave for one hour. After one hour, remove the pot from heat and place it over your sink. Open cold water over the closed pot and remove the whistle cap to let the smoke out. Once the lamb is ready, add piece by piece to the pot of Jameed (Yogurt). Clean the lamb broth from all the extra ingredients by using a strainer. Add 5 cups of the lamb’s broth into the Jameed (Yogurt) pot that now includes the cooked lamb pieces. Leave Jameed to boil again with the lamb pieces. 1/2 hour to 1 hour. Wash the 3 cups of rice very carefully until starch is completely gone. Keep rice in room temperature water for over one hour. If you are in a hurry then use boiling water instead and leave for 10 minutes. Bring a new pot and add Sunflower oil, olive oil and butter. Once pot is hot and butter is melted add the rice without the water, use a strainer if needed. Add salt, turmeric, mixed peppers, ground pepper, and ground hale. Keep moving the rice with a wooden spoon, until the rice is moist and add lamb broth over the rice. Rice must be covered with water, so you can also add boiling water until all the rice is one inch over the rice level. Once it is boiling, add iron cooking metal mat below the pot and reduce heat to low. Leave the rice over low heat until it is ready. If you wish to leave the rice for later, overwrap the pot with cloth and hide it inside the oven. Use a big tray/dish where you will be distributing the pieces of shrak bread around the tray/dish. Drizzle the bread with hot Jameed sauce by using a spoon and dripping over the bread on the big tray/dish. Add the rice on top of the shrak bread. Add the pieces of the cooked lamb on top of the rice. 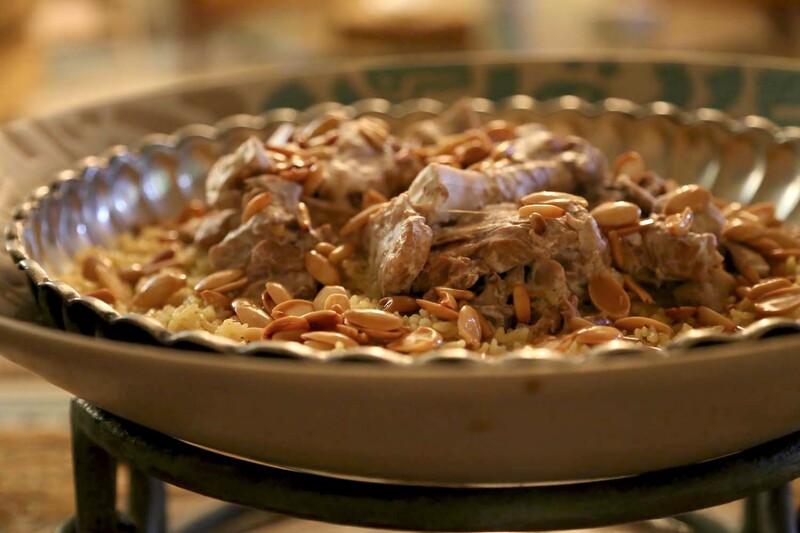 Add the roasted almonds & pine-nuts over the lamb and rice. Add the Jameed on a separate bowl and serve. Cut green chili into pieces and add the pieces into a mixer and mix until very soft and small. 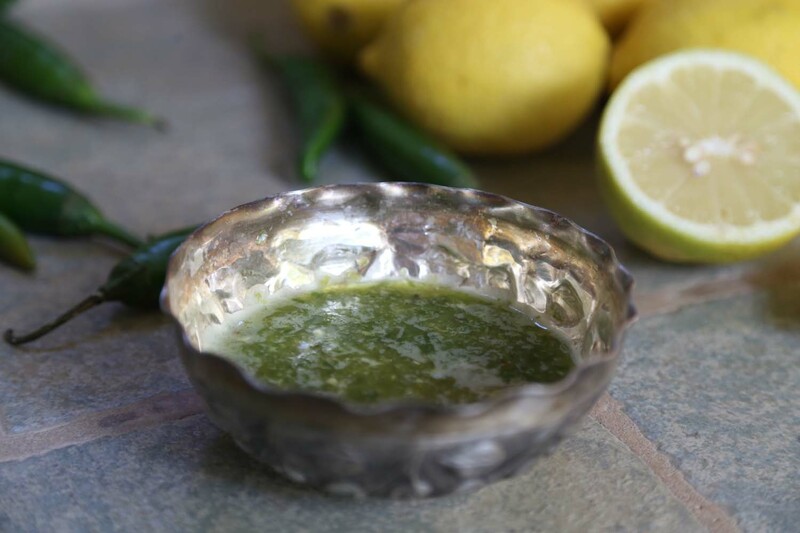 Squeeze the lemon to lemon juice and add it to the ground chili. Add the pinch of salt and mix all the ingredients again.